I must admit that I'm a bit rattled at how few fans are outraged that you can complete the first episode of Batman by pushing fewer than 10 buttons of QTEs and the tiny roaming areas cannot be failed at all. I don't know why I even still care. They have to at least change that. AT LEAST go to Heavy Rain standards of gameplay. Either that, or they can just go make visual novels so I can completely write them off. Episode 2 of Batman comes out September 20th. Just do it, man. They're not worth it. They're not "games." I'm not rattled because I literally do not care about them anymore in any way shape or form. Par for the course to me. People don't mind now, but when Season 2 and Wolf Among Us launched with a streamlined formula from Season 1 to be even more cinematic, even the modern-era Telltale fans that only joined during/after Season 1 pointed that out and were angry at the time. On top of that, Telltale also deliberately shortened their episodes from 2-3 hours for Season 1 to 90 minutes for Wolf/Season 2 to make episodes more streamlined and cinematic in pacing, so that made people even more angry. In the time since, Telltale has gotten back to making slightly longer episodes that range from 1:45 to 2:30, but even now, not even the modern fans like the change in gameplay from Season 1 to their newer titles. Rather, they just gave up on speaking out about it as much. However, modern-era fans only blamed it on Telltale working on... [gasp] having multiple upcoming games coming soon at once (which is a trend that has gone on LONG before the era of Season 1), instead of recognizing that these were deliberate choices that Telltale made to make their games more cinematic. They think that the free-roam areas take more work than making the dialogue selection scenes which you have to choreograph, animate, voice over, etc. Don't they know the way it works? They got all that attention for WD Season One and then they got OSCAR FEVER. Or whatever the video game version of that is. I don't care about Telltale anymore. I admit, I was intrigued by the trailer for their Batman game, but after reading this thread I'm not anymore. Telltale is free to make games how they want, but I'm not buying any of them. The last episode I bought of theirs was WD 400 Days. I mean, sure, I'll play Back to the Future with my nephews some day because they watched the Trilogy for the first time last weekend, but I'm not buying anything new. That being said, my interest lately in buying new video games altogether has waned enormously in favor of board games, so there's that. I think the only thing that would get me to buy a Telltale game is if they released another Tales of Monkey Island game, another Sam and Max game, or a Doctor Who game. Though, I do need to buy Strongbad's Cool Game for Attractive People still. I never would have played another after TWAU had they not found my weak spot. 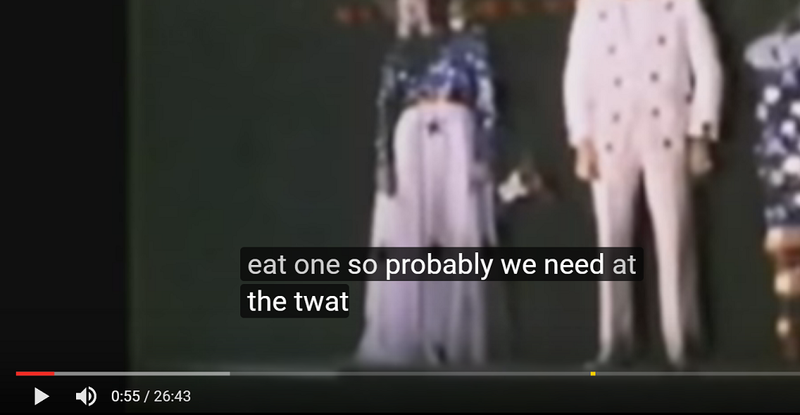 Youtube's auto-generated subtitles have a strange idea of the lyrics to The Star-Spangled Banner. Looks like one of the old mods came in a couple days later and made a very interesting comment. You from there, new guy? That old moderator said that when the Telltale's license for King's Quest expired that fans were livid....I was livid that they got a hold of King's Quest in the first place! I was relieved when they decided to abandon it. It's the one of the blessings I count from the whole ordeal. They didn't have a chance to ruin it. We already saw the writing on the wall with BTTF and JP and I knew there was no going back. The only question was what they were going to ruin next. I mean, as nice and awesome as the old TTG staff were, one of them who was in contact with a couple key members of the community was actually asking opinions on how a King's Quest game should be portrayed. While I appreciate that level of openness and respect for getting it "right", it just goes to prove that they didn't understand it. I'm glad they let it slide. TTG Jurassic Park: "It's just a bunch of quicktime events!" "It's a good thing TTG didn't get a chance to ruin King's Quest!" The Odd Gentleman's King's Quest, Chapter 1: A whole sh**load of quicktime events! "Hey, this isn't too bad!" I think it's pointless hating something that doesn't care either way. If you don't like what they do now then just don't buy and play their games, there are plenty of people who do like that sort of stuff. Fair play to them for finding a way to be successful in an area where regular success is hard to come by. Making things is hard and it's even harder to make things that a large number of people enjoy. You can be sad that they seem to have forgotten their roots but at the end of the day it is a business and the people who were there to give it the feel that it had are now largely gone because people move on. Personally I can still get enjoyment out of their games, old and new and I'll still pick up a game they release if I'm interested in it, though because of my budget that'll usually be when it's on sale a year or so after release. I'm not yearning for the "great days of Telltale" because they didn't exist. I do feel cheated and used by them, and I'll always hold a bit of a grudge for that reason, but I don't care what they're doing. I am dismayed that so many people are falling for their "visual novel" approach. It's not even that good. They should change their name to Tell Tale Stories because they're not games. Or Tall Tale Games *chuckle*. I will never be interested in anything they do again unless they abandon their hands-off approach to game/player interaction. I don't care how good their stories are. That's all it is for the first 5 minutes. After that...very sparse. Like 3-4 other instances max? Which is a far cry from the QTE/dialogue-fests that are Telltale's games. Even if they did overdo it, just by sheer presence of the puzzles in TOG's KQ alone makes it better. Yeah, that's why I specified only episode one was nothing but QTEs. Others have told me (possibly even you I think?) that the later episodes are fine. Yeah that was me. And I'm talking about the first episode. The first 5 minutes has all QTEs but after that it's sparse. Did you play the rest of the episode yet? It's nothing like the first five minutes. I only played the first two King's Quest episodes but even the first episode wasn't that bad. Are you sure you didn't just play the intro/demo (if one exists, not sure). After you get out of the introduction area you have quite a large area to explore with quite a lot of puzzles (with multiple solutions, which is a much more interesting take on the choice mechanic than anything I've seen Telltale do) and plenty to explore in your own pace. It's definitely not just a collection of QTE's. That's simply not what the game is. It's actually what I was hoping Telltale's games would turn into when I was playing their early Sam & Max games. I'd love a new take on a Lucas classic (or a game with that vibe) on that scale, with that laid-back pacing. Guardians of the Galaxy: Codename Blue Harvest. So that's what it is, huh? Marvel and Telltale. I could not be less interested. I like Guardians of the Galaxy, but it's been a long time since I've had any interest in a game from Telltale, and it probably won't be on Linux anyway. This is awesome news. I've had no exposure til Guardians of the Galaxy before the movie, but after that it feels like a perfect fit for Telltales model of games. They're interactive novels, and very fun as such. You just have to drop any and all expectations of them being adventure games in the old sense. Had great fun playing both The Wolf Among Us and Tales from the Borderlands. I said I'd never buy another game from Telltale until they change their business model back to adventure games, but this is testing my fortitude. I'll see how it reviews.